I'm sure you're thinking: Hey! What's with all the guest posts all of a sudden? Or maybe you're not. I have no idea what you're thinking. Regardless, there is a method my madness, and one of the reasons is that I'm trying to accomplish ... stuff. Mysterious and myriad stuff that I will be able to share with you very soon. Meanwhile, it's been easier for me to invite a few friends over to chat with you while I'm MIA. This helps them get the word out about their novels and I don't have to wrack my feeble brain for entertaining blog posts for you. Not that I don't like writing dark stuff for you, but every now and then, it's good to lighten up. So today we lighten up a bit with a guest post from Terry Newman. Terry is a former medical research scientist and lecturer who came into writing via comedy writing for the BBC and Channel 4. His part-time interest developed into a fully-fledged occupation and he finally hung up his microscope for good in 2004. Since then he has written extensively, both drama and comedy, for stage, film, television, radio and New Media throughout the world. Now, I know there has been discussion about some readers are getting tired of darker novels. 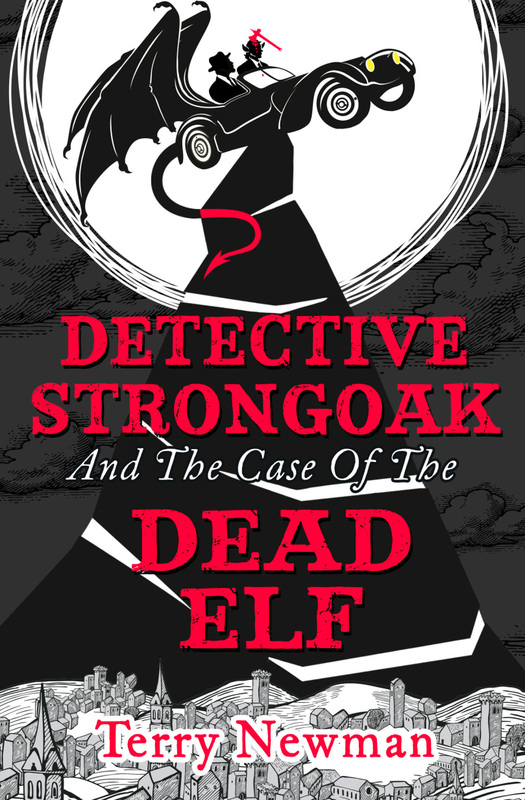 If you're one of those people, and even if you're not, you just might be interested in Terry's debut novel Detective Strongoak and the Case of the Dead Elf. And don’t ever mention that you yourself have written a book that combines dwarfs and elves and the tropes of fantasy writing, with detective fiction, to humorous effect; you might as well admit to dog baiting - with puppies. I did, mention my book that is, not the puppy stuff: I was framed there. I hate coriander, unless I’m in the USA in which case I hate cilantro. Call it what you want, I loathe it. I don’t mean a mild aversion here, a preference or a dislike. I’m talking about the full: argh-I’ve-been poisoned-how-the-hell-do-you-put-that-in-your-mouth? experience. Coriander, essentially, tastes evil – it is King Joffrey’s navel fluff, it is Lord Voldemort’s missing nasal hair disguised as a simple green herb. In Mordor this stuff grows wherever elf blood has been spilt. I was therefore very interested to read recently that there may be a genetic basis to coriander revulsion (or liking) and that two genetic variants are linked to perception of the herb, the most common of which is a gene involved in smell. Wow! Yes, that’s why it even smells like gollum’s body odour! The gene (called OR6A2 – and no, not a droid from the next Star War’s film) is connected to a sensitivity to the aldehyde chemicals (YUK!) that give cilantro its distinctive taste (YUK, YUK, YUK!). Aldehydes are not made for eating in my book. So, there might be some logic though to why some strange people can eat this ‘devil herb’? It’s in the genes. And then I thought about fantasy. Could there be a good reason for why some people don’t like fantasy? A reason other than them being unbalanced, that is. Could there even be a genetic predisposition? If we go back to the basic human tribal unit, our ancestors would gain an advantage if there were a variety of skills present within the group. Imaginative, visionary, inspired, members are of course going to be a huge advantage to our primitive tribe. However, there would still be a need for the pedestrian, the colourless and the unremarkable. The people that can do all the dull stuff that needs to be done to ensure the tribe’s survival as well. The diggers of tubers and roots, the carriers of water, the bean finders and proto-bean counters. And, naturally, these people don’t need to like fantasy! In fact it might even be a bad idea if they did. They just need to ensure a regular supply of vitals for us while we get on with dreaming up fire, the wheel and the barbecue trolley. Not everybody can be allowed to have a head full of fabulous ideas and images. I know this seems a shame for these individuals, but hey that’s the way nature works sometimes and they can always go and pick themselves some coriander if they want. None for me thanks, I’m busy dreaming up a world where magic grows on trees and is harvested under a full moon by elves, and dwarfs too. If you're interested in keeping up with Terry, you can find him on Twitter, Facebook, or at Detective Strongoak and the Case of the Dead Elf.